There is an old saying among outdoor adventurers and a good motto for all: "prepare for the worst and enjoy the best". Those words rung true this past weekend as Hermine passed by our coastal areas with little more than wind, choppy sea conditions, higher than normal tides and for Ocean City some rain on Saturday. The best part of this was the cooler temperatures that brought down water temperatures throughout Maryland. If fish can smile they surely are in relief this week. Fishing for striped bass near the mouth of the Susquehanna and Elk Rivers is steadily improving near the outside edges of the flats. Water temperatures are slowly falling but the fishing there is still an early morning, late evening affair with topwater lures. Although a good portion of the striped bass are falling short of 20 inches, there are enough larger fish to keep everyone happy. Farther down the upper bay region striped bass are being found chasing schools of bay anchovies and providing some fun fishing for those casting to the surface action or jigging below. Most of the fish being encountered are undersized but there are fish over 20" being found mixed in. There has also been similar action in the mouths of some of the region's major tidal rivers. Trolling has been another option and most are pulling small spoons and bucktails or umbrella rigs down deep along channel edges. Chumming and live lining spot and white perch continues to be productive near Love Point and Swan Point. Mike Genco was fishing near Pooles Island when he got a surprise with this black drum which he released. The Bay Bridge piers and rock piles have been providing striped bass action for those live lining spot near the deeper piers. Others have been having good success with jigging bucktails and soft plastics. Pesky small bluefish have been rough on soft plastics. White perch fishing has been very good in the upper Bay's tidal rivers and creeks this week with some of the better catches being made with bloodworm baits in deeper waters. Spot are being caught on hard bottom in some of the shallower areas and near the shallow ends of the bay bridge. In the middle bay region all the news is about falling water temperatures and breaking fish. The surface water temperatures have dropped about 10° in the past week and despite another pulse of hot weather this week, water temperatures should continue to stay below 80°. Breaking fish composed of various sizes of striped bass, Spanish mackerel and small bluefish are being seen throughout the middle bay region. The mouth of Eastern Bay, off Chesapeake Beach, the mouth of the Choptank and Little Choptank have been common places to encounter this deadly trio making life tough for bay anchovies and small menhaden. Casting to the breaking fish or jigging underneath is always fun and it also pays to keep a sharp lookout for slicks that can indicate there is mayhem occurring beneath the surface or there was some recent action. Depth finders have great value this time of the year and definitely earn their keep. Trolling has been a good option and most are trolling a collection of small spoons, surge tube lures and bucktails. Surge tube lures and bucktails are generally being pulled behind inline weights and small spoons behind planers for a mix of striped bass, bluefish and Spanish mackerel. Large red drum are in the region and it pays to put out at least one large spoon in a trolling spread. Live lining spot has been center stage for those seeking a nice grade of striped bass along channel edges from Dolly's south to Breezy Point and near the False Channel at the mouth of the Choptank. More than a few live liners have been getting a little more than they bargained for when large red drum pick up a live spot and take off for parts unknown. Fishermen have been watching in disbelief as line vanishes off reels and they are left with an empty spool. Kevin Lengerhuis holds up a nice striped bass he caught while live lining recently. As of late last week the shallow water striped bass fishery in the middle bay region was a bit lackluster to say the least due to high water temperatures. In many areas the waters were also churned up from large gatherings of recently pupped juvenile cow-nosed rays rooting up the shallows and causing a lot of floating grass. As if to add insult to the whole scene stable flies have been out in force hammering away at ankles and driving the most peaceful anglers into madness. I'm not sure how much longer these pests will be around but if you're going out, don't forget the bug spray. White perch fishing has been improving along shoreline structure areas as water temperatures drop and the best catches have been coming from some of the deeper water areas. Casting off a dock or pier with a simple bottom rig baited with bloodworms or grass shrimp has been paying off with some nice perch. If your dock or pier is extensive and over deep water, don't cast out but fish directly below close to the pilings. That is where the perch will be. There has been some limited croaker fishing in the evenings near channel edges out in the bay but generally it is nothing to write home about. The croakers are about 10" to 11" in size and the fishing is fair at best. 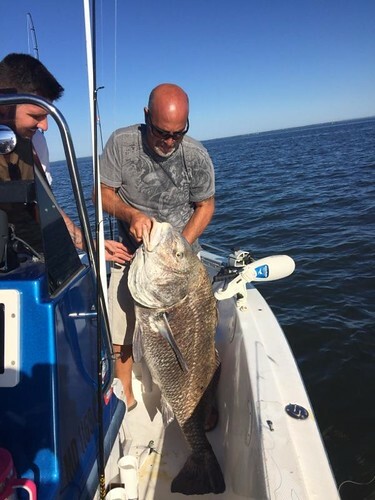 The lower bay region continues to have some exciting big game fish action as large red drum and cobia provide some of the most exciting fishing to be found in Maryland waters. The red drum are big with some being reported to be over 50 lbs. or more, They are being caught by trolling large spoons or by casting large spoons or soft plastic jigs to schools of red rum feeding on menhaden. At times the red drum are pushing the menhaden to the surface which makes for a very exciting scene. The area around the Target Ship and the Mud Leads tend to be ground zero but feeding red drum can be spotted most anywhere on the eastern side of the bay. This is of course a catch and release fishery only so be prepared ahead of time with cameras and a routine to get the fish released as quickly as possible. Cobia fishing remains great from the middle Grounds/ Buoy 70 area up past the Target Ship. The most common way to fish for cobia has been to chum and drift menhaden baits back into the chum slick. Bluefish and the occasional striped bass have also been part of the mix. Breaking fish are being spotted throughout the lower bay region from the Potomac to Tangier Sound. The action tends to be made up of striped bass mostly under 20", bluefish and Spanish mackerel. Bay anchovies tend to be "what's for dinner" with this group but small menhaden can get caught up in the carnage also. Casting spoons or jigging underneath are the most common ways to fish but trolling along the outside edges of the action can also pay off. 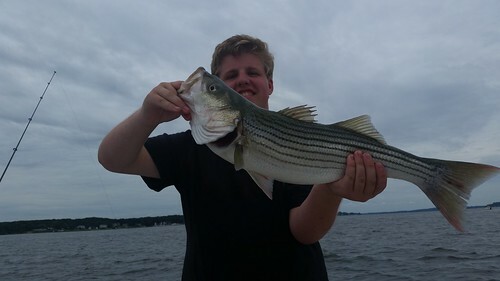 Bottom fishing in the lower bay region for a mix of large spot, medium-sized croakers, white perch along with small bluefish and sea trout has been very good. The lower Patuxent and Potomac have been offering some of the best opportunities but the Tangier and Pocomoke Sound area has also been offering good fishing. Recreational crabbing continues to be very good in most areas in the bay's tidal rivers and creeks. In the upper bay regions there are good reports from the Gunpowder, Chester and Magothy Rivers. The middle bay region has been offering excellent crabbing with some of the largest crabs coming from deeper waters and razor clams continue to be the bait of choice for the best catches. Unfortunately small crabs and sooks are chewing up clam bags and for that reason chicken necks are beginning to gain favor. 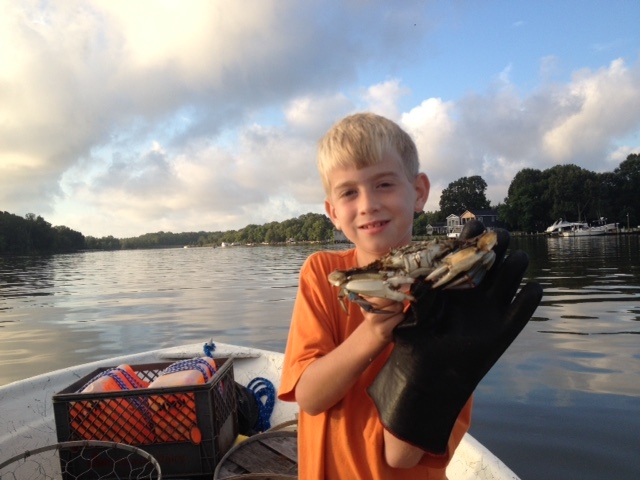 In the lower bay region it is almost impossible to find any tidal river or creek that is not offering outstanding crabbing opportunities this week. Before we get into the freshwater fishing reports, here is an update on Bay water conditions from the DNR water quality monitoring team. This information will help to point you in the right direction for locating striped bass in the Bay. (Hint: surface water temperatures are cooling off which means that fish will start to spread out over a wider area). Based on the latest Maryland DNR water monitoring data collected August 29 - 31, 2016 there are still large areas of mid-bay deep water habitat (deeper than 25 feet) with oxygen conditions unsuitable for Striped Bass. 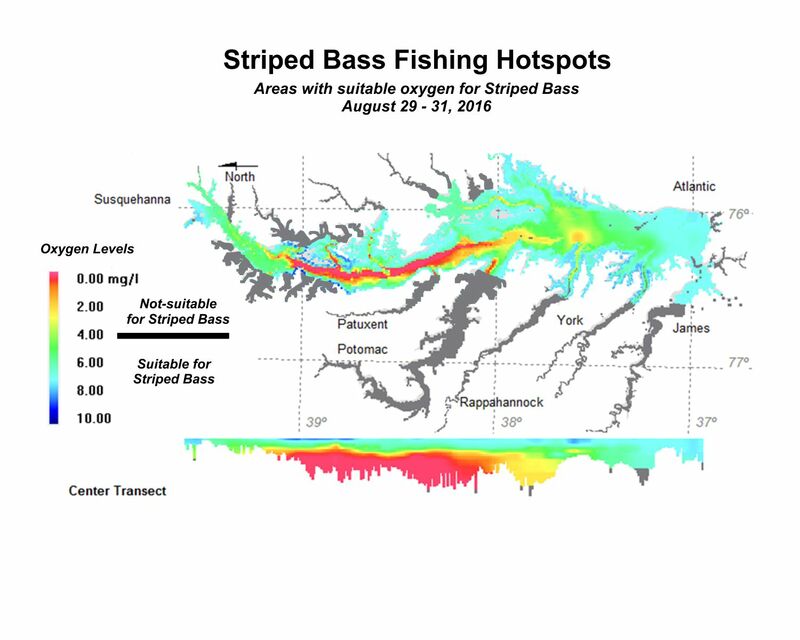 While surface water temperatures are still warm for striped bass, they are well mixed and have cooled to 80 F at the Susquehanna down to the 77 F waters from the Patapsco down to the Potomac River, providing Striped Bass with more areas within their temperature range. Real-time Chesapeake Bay surface water temperatures are available measured at NOAA's buoybay.noaa.gov website. Note: Data for the map is collected by both Maryland and Virginia monitoring teams and funded by both States and also EPA's Chesapeake Bay Program. Last report suggested anglers explore the Chesapeake Bay bridge area from Rock Hall down to the Choptank River, at depths shallower than 25 feet, including surface waters. However, with the 5 degree drop in water temperature, the range up and down Bay will likely expand. Continue to focus on depths shallower than 25 feet deep. The best fishing areas could be further refined by intersecting these prime areas with underwater points, drop-offs, large schools of baitfish and moving water. These patterns will continue until there are major changes in weather such as high sustained winds, long periods of cool weather or rain. Cooler weather means cooler water temperatures for freshwater fish species and with those cooler water temperatures comes increased fish activity. The early morning bite will start to last longer into the mid-morning hours and the evening action will start early. At popular resort areas like Deep Creek Lake the lake will start to become more civilized as summer vacationers begin to haul boats out for long term storage and peace one again returns to the lakes waters. Shoreline waters will show less staining from boat wakes and boat traffic in general will lessen. Smallmouth bass are being found over rocky points and near some of the floating docks over deeper water. Largemouth bass are near grass and shoreline structure such as fallen treetops and floating docks. Yellow perch and walleye are holding near deep grass and northern pike and chain pickerel are in the cove areas. The upper Potomac River continues to be running low and clear this week and water temperatures are quickly dropping due to cool morning temperatures. Smallmouth bass fishing is getting better but conditions make for some stealthy fishing mandates. Largemouth bass will start to feel increased desires to feed with cooler water temperatures and the fishing is only going to get better as the month proceeds. The weekend's blow and churned up waters tended to put a hamper on the fishing in the Ocean City area early this week but conditions will improve and as is often the case a stir like this only improves fishing in the long run. The surf has already calmed down and fishing for a mix of kingfish, croaker, flounder and small bluefish will improve. The annual migration of mullet will be arriving soon and that usually puts the striped bass, red drum and bluefish activity in high gear. At the inlet and Route 50 Bridge are look for better fishing as water clarity improves this week. The back bay areas are in the same situation with water clarity improving each day. Only a few boats have ventured out the inlet this week because of choppy conditions but those that did returned with great catches of yellowfin tuna from the Washington Canyon area. Traditionally white marlin fishing will be at its peak in the next two weeks and a mix of dolphin, wahoo and bigeye tuna will help round out catches.